This 15 day trip will provide you with opportunities that you will not be able to find anywhere else in the world! You will have a thorough overview of all that Morocco has to offer, from pristine beaches to majestic mountains and a full helping of everything that the different local cultures have to offer. You will experience nomadic camps in the Sahara, High Atlas Mountain villages, ancient kasbahs, and modern surf shops in Essaouira. Morocco is truly a country of vast diversity, and it is our hope that you will fully experience this on our Moroccan Berber trip. Join us as we give you just a taste of all​ ​of​ ​the​ ​incredible​ ​experiences​ ​that​ ​Morocco​ ​has​ ​to​ ​offer! Day​ ​1:​ ​​Arrival​ ​day Arrive in Casablanca, where you’ll meet your tour leader and have your first taste of Morocco in it’s largest city. Depending on your time of arrival, you will have some time to explore and see firsthand the mixing of cultures throughout the city. From European-style art deco architecture to the conversations in French that you’ll hear on the streets, the legacy of French colonization is everywhere. In the middle of these things, however, you will find hammams, Moorish styled building elements, souqs, and all the others things that are associated with what is considered traditional​ ​North​ ​African​ ​culture. Day​ ​2:​​ ​Casablanca-Rabat-Meknes We will start our day by visiting the largest mosque in Morocco, Hassan II Mosque. Finished in 1993 and situated right on the edge of the Atlantic Ocean, this beautiful structure can easily hold 25,000 worshippers during peak times of use. It is well worth visiting for its beauty and magnificence, but also for the opportunity it affords to contemplate the lives of the people who use this mosque and who we will be meeting over the next two weeks. Following your tour of this impressive and grand structure, we will hop onto our comfortable, air-conditioned van for a few hours drive to Rabat, the first of the four imperial cities of Morocco. Rabat is Morocco’s capital and second largest city, and like Casablanca it also commands a scenic view of the Atlantic Ocean. We will have a few hours here to explore the kasbah, which has managed to maintain its history with only a touch of modern influence. After another 2 hours of driving time, we will arrive in Meknes where we will stop for the night. Meknes is the second of the imperial cities that we will visit, chosen by Moulay Ismail to be his capital city in the 17​th century. Moulay Ismail was one of the most important kings in the Alaouite dynasty, and you will have a chance to​ ​explore​ ​his​ ​legacy​ ​in​ ​Morocco​ ​further​ ​as​ ​we​ ​explore​ ​Meknes​ ​by​ ​night. Day​ ​3​:​ ​​Meknes​ ​to​ ​Fes After breakfast at the hotel, we will spend part of the morning walking through the streets of Meknes with a local guide. A stop at the food market is a must, where you’ll be able to sample all types of pastries before continuing along in your journey back into the 17th century. After this, we will head on to Fes. In total, we will spend about 2.5 hours driving today, but you will barely notice the time because of the stops we will make along the way! 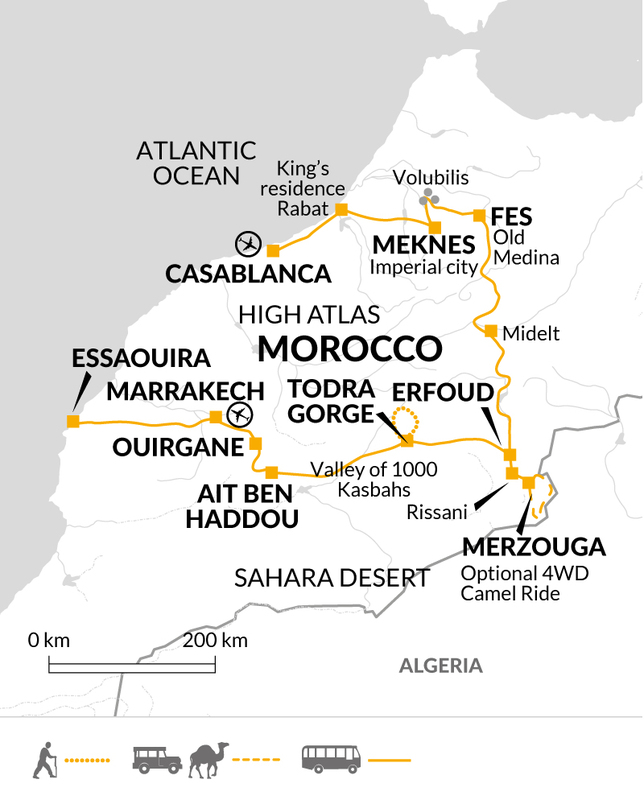 From Meknes, we will take a scenic route through the countryside for about one hour before arriving at Oualili, perhaps better known as the well-preserved and partially excavated Roman city, Volubilis. After spending some time exploring the ruins we will head to the nearby town of Moulay Idriss, the most important holy place for Muslims in Morocco, which has only allowed non-Muslims to stay overnight since 2005. The town itself is compact, and it’s narrow streets are spread across two hills, offering you views of the fertile fields and olive groves below. After spending some time in this​ ​interesting​ ​town,​ ​we​ ​will​ ​continue​ ​on​ ​to​ ​Fes​ ​where​ ​we​ ​will​ ​stop​ ​for​ ​the​ ​night. Today you’ll spend all day exploring Fes, another of the former imperial cities of Morocco, with special attention being given to its medina and it’s 10,000 winding streets and alleys. Fes’ medina is most known for it’s size, being the largest car-free urban area in the world, as well as it’s many historically and culturally significant landmarks. We’ll provide you with a government certified local guide for the day, who will introduce you to the oldest continuously functioning university in the world (University of Al Quaraouiyine, founded in AD 859), the Bou Inania madrasa (a 14​th century religious university famed for its carved wooden walls and Arabic calligraphy), as well as several other locations which will help you to further understand this complex and awe-inspiring city. And what trip to the Fes medina would be complete without a visit to the famed tanneries? We’ll make sure you’re provided with a sprig of mint to help you cope with the smell of the leather being processed, and then you can watch the tanners at work from a balcony until you’re content. And make sure you bring some cash with you on this day…the quality and quantity of leather goods, ceramics, and textiles that you’ll find here is unmatched! Day​ ​5​:​ ​Fes​ ​to​ ​Midelt The next few days of this trip will provide you with opportunities to experience the more traditional and ancient side of Morocco, which will provide a nice contrast to the cities which we have been visiting. But before we can say hello to forests and desert, we will have to say our goodbye to Fes and all of the things which make it a favorite of visitors. Our drive today will end in Midelt, and will take about 5 hours in total, but along the way we will stop in Ifrane where you can discover why it is called the Moroccan Switzerland, as well as at the Cèdre Gouraud Forest where you will visit with Barbary Macaque apes in the midst of a towering cedar forest in the Middle Atlas Mountains. In the evening, after settling into our riad in Midelt, we will head out on a lovely walk in the Berrem Valley, exploring the Berrem gorge, seeing a bit of the traditional methods of irrigating, and visiting a Berber village built entirely with mud. In this village you may have the opportunity to have a look around the inside of a Berber family home, as well as taking a look at traditional community bread baking facilities, and possibly playing with the friendly local children. This will be a unique and once in a lifetime opportunity to see a side​ ​of​ ​Moroccan​ ​life​ ​which​ ​is​ ​not​ ​available​ ​to​ ​the​ ​average​ ​tourist​ ​in​ ​Morocco. Day​ ​6:​​ ​Midelt​ ​to​ ​Merzouga/Sahara​ ​Desert​ ​(Erg​ ​Chebbi) Most visitors to Morocco look forward to their night spent under the stars in the midst of the Sahara Desert, and that day is finally here! In order to get there though, we’ll spend about 4.5 hours driving through the Middle Atlas Mountains and some spectacular countryside. Even though the evening and overnight spent in the Sahara is the highlight of this day, we don’t think you will be disappointed with the majestic mountain scenery that we’ll have throughout the day, so we are going to take our time with this drive so that you can fully enjoy all that these views have to offer. Be sure to let the driver know if you want to stop for photos, or just for a few minutes of contemplation before these mighty mountain views. Once we have arrived in our jumping off point outside Merzouga, we’ll be provided with camels and some quick but thorough instruction on riding them (lean back when they are standing up! 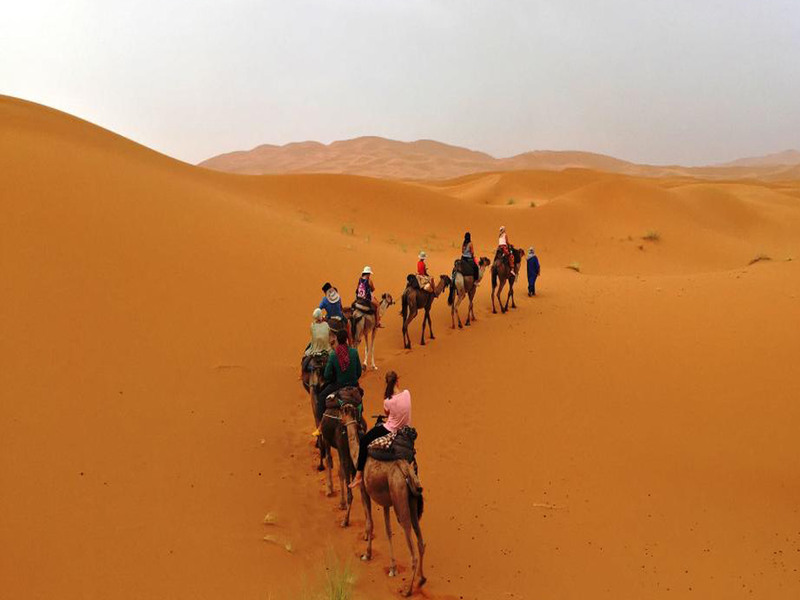 ), and then we’ll be off into the golden sand dunes of the Sahara! About an hour after we set off we’ll arrive at our nomadic campsite, where we’ll find tents and stars and a sunset which will be best seen from the top of a nearby dune. And if this wasn’t enough, we’ll also have traditional music around the campfire after the sun goes down. You may even have the chance to join in the music-making, so make sure your hands and fingers are ready for some enthusiastic drumming! Day​ ​7:​ Merzouga-Todra​ ​Gorge After watching the sun rise over the sand dunes of Erg Chebbi and enjoying a cup of mint tea, we’ll climb aboard our camels again and head back to our vehicle and the modern world. Make sure you keep your camera handy during the ride back, as the early morning sun almost seems to make the Sahara glow, making every picture a perfect one! After a leisurely breakfast, we’ll begin an approximately 3 hour drive on to our next destination – Todgha (or Todra) Gorge in the midst of the Todgha Valley. As always, there are optional stops that we can make to break up the drive, as well as opportunities for picture stops as we make our way through some stunning parts of the High Atlas and Anti-Atlas Mountains. Once we arrive in Todgha Valley, you will have an opportunity to explore the gorgeous valley and gorge and the mud villages built along the sides. The canyon walls are in some places an impressive 300m high, and present an awe-inspiring contrast to the peaceful Todgha river and surrounding farmland. We’ll have two nights here, so make yourself at home and immerse yourself in the beauty of the​ ​local​ ​Berber​ ​culture​ ​and​ ​scenery. Day​ ​8:​​ ​Todgha​ ​Gorge This will be a free day with opportunities for hiking and exploring, doing a bit of shopping among local village craftsmen, or just relaxing by the hotel pool or at the local hammam if you are interested. We will soon make our back to hustle and bustle of Moroccan cities, so make sure you soak up as much relaxation as you can today! A couple of our favorite hikes are listed below, but we encourage you to discuss your desires with your guide​ ​before​ ​deciding​ ​on​ ​anything​ ​for​ ​this​ ​day. Hike 1 (1.5 hours): This will take you around the inside of the valley and through some of the local fields where you will meet some of the local farmers while they are out cutting grass for their cows at home. In addition to this, the hike will take you through some of the villages where you will be able to interact with the local Berbers and view their way of life as they go about their days. In one of the villages there will be an opportunity​ ​for​ ​tea​ ​or​ ​cold​ ​drinks​ ​before​ ​we​ ​make​ ​our​ ​way​ ​back​ ​to​ ​the​ ​hotel. Hike 2 (5 hours): This is a more difficult hike, with many ascents and descents, but it is a favorite because it is as rewarding as it is difficult. The views you see will be amazing, but it is the possibility of meeting another type of nomad which spend their lives living in caves which is the real highlight of this hike. If the timing is right, we will be able to spend some time with them, drinking tea and learning more about their lives. The hike may be a bit more challenging, but the opportunity to meet these nomads is one that not many​ ​visitors​ ​to​ ​Morocco​ ​ever​ ​have! Day​ ​9:​ ​​Ait​ ​Benhaddou​ ​Kasbah A leisurely drive of approximately 3 hours will take us away from the red gorges of Todgha and through valleys along the One Thousand Kasbahs route. While the excitement of exploring Ait Benhaddou Kasbah is forefront in everyone’s mind, we do have one stop to make today in Ouarzazate, also known as the Moroccan Hollywood and the Door to the Desert. Famed for being the filming location for parts of​Gladiator, Lawrence of Arabia, Kingdom of Heaven, ​ and​Game of Thrones, it’s well worth a stop in this interesting city on the edge of the desert. After lunch and some time for exploring, we’ll continue on to the World Heritage Site of Ait Benhaddou Kasbah, perhaps one of the best known UNESCO sites in Morocco as well as the kasbah of choice for many postcards and souvenir photos. A late afternoon walk inside the kasbah will give us the opportunity to learn more about the history and lore of Ait Benhaddou Kasbah, as well as​ ​the​ ​cultural​ ​significance​ ​of​ ​the​ ​emergence​ ​of​ ​kasbahs​ ​in​ ​Berber​ ​history. Day​ ​10:​​ ​​High​ ​Atlas​ ​Mountains Today we will have the opportunity to get to know the High Atlas mountains and the people living within them better as we make our way across Tizi N’Tichka Pass and towards Imlil and Mt Toubkal. It will be a longer driving day (approximately 5 hours) as we make our way through winding mountain roads up to and through Tichka Pass, but the slower drive will give you plenty of time to observe both these majestic mountain panoramas and the lives of the people living within them. We’ll make at least one stop at the top of the pass so that you can take photographs and spend some time enjoying the surrounding High Atlas peaks vistas, but then we will need to push on towards Imlil and our first views of the highest peak in North Africa, Mt Toubkal. Once we have arrived in Imlil we will either rent mules or set out at a walk towards our Berber family homestay in a nearby village. The total time to the village from Imlil will be approximately 40 minutes, which will give you time to stretch your legs and contemplate the changing scenery. One of the highlights of your trip is sure to be tonight’s homestay with a local family, which includes comfortable beds, a filling home-cooked meal, all of the mint tea you can drink, and the opportunity to do some serious star-gazing far from the​ ​city​ ​lights​ ​of​ ​Marrakesh. Day​ ​11:​​ ​Imlil​ ​to​ ​Essaouira After one last home-cooked meal and a final cup of mint tea, we’ll say goodbye to our new Moroccan family and make our way (approximately 4 hours of driving) towards the ocean breezes and pristine beaches of Essaouira. This small city of 70,000 people is sure to enchant with its relaxed atmosphere and car free, UNESCO heritage recognized 15th century medina. Take some time to stroll along the fortress walls that overlook the ocean, meander through the medina, watch local fishermen at work in the harbor, or read a book on the beach. There are also visits to be made to local craftsmen who work with local woods, horses and camels to ride on the beach, local Jimi Hendrix lore to explore, and opportunities to try your hand at kitesurfing or windsurfing. There are also plentiful spas and centuries full of history to learn about – you will have no problem finding​ ​things​ ​to​ ​do​ ​here! Day​ ​12:​ ​​Essaouira We are quite sure that you will want to spend more time in this special city, so we will have another full day to spend here. After an orientation walking tour in the morning, you will have the entire afternoon free to enjoy as you wish. Let us know if you need assistance​ ​in​ ​planning​ ​or​ ​arraigning​ ​any​ ​activities! Day​ ​13:​ ​​Essaouira​ ​to​ ​Marrakesh You will have one last morning in Essaouira to finish exploring and say goodbye to this captivating city before we make our way to the Red City of Marrakesh in the afternoon. After an easy 3 hour drive past argan trees and away from the Atlantic Ocean, we’ll arrive in Marrakesh with just enough time to check into our hotel before heading to one of the most well known squares in all the world – Jamaa el’Fna. We’ll have our dinner at one of the myriad of food stalls before immersing ourselves in the local carnival-like atmosphere. Monkeys, snake charmers, storytellers, and acrobats can all be seen on an average night, and it will be very easy to see why all of Marrakesh converges in this place. After the relaxing pace that we experienced in the mountains and at the beach over the last week, the seeming chaos of Marrakesh is sure to give you a bit of culture shock,​ ​but​ ​it​ ​will​ ​wear​ ​off​ ​quickly​ ​as​ ​you​ ​experience​ ​more​ ​of​ ​this​ ​grand​ ​city! Day​ ​14:​ ​​Marrakesh You’ll have the entire day free to enjoy as you wish in Marrakesh today. Options range from a relaxing visit at a local hammam to exploring local art galleries and museums and gardens. Or you can choose to people watch at a local cafe with a glass of mint tea and a good book. Another option is to take a cooking class where you will learn to replicate a few of the dishes which Morocco is so famous for (feel free to amaze your friends back home with both pictures of your trip and your new tagine-making skills!) This is your day, and we are here to help you fill it with activities that will perfectly suit your final day in majestic Morocco. And of course there is the medina to be explored and​ ​scoured​ ​for​ ​all​ ​of​ ​your​ ​last​ ​minute​ ​souvenirs.​ ​The​ ​options​ ​in​ ​Marrakesh​ ​are​ ​limitless! Day​ ​15:​​ ​Departure​ ​day Today you’ll say goodbye to your guide and to majestic Morocco. It is our hope that throughout this trip Morocco has become like a second home to you, and that you’ve come to appreciate all of the beauty and diversity that she has to offer. After goodbyes, we’ll make sure that you are transferred from your hotel to the airport or train station in time​ ​for​ ​the​ ​next​ ​part​ ​of​ ​your​ ​journey.